Q: How many miles can I go on a charge! A: This is the number one question for ev's and there is no simple answer. The miles will differ do to the type of vehicle,weight of vehicle,type of batteries,type of terrain you are driving on. This is no different then a gas engine. If you are driving a VW you will get more miles then a pickup truck and you will use more gas going up hills then on flat terrain. We are getting 35 miles with the least expensive lead acid batteries ($60 each) you can get 45 with AGM batteries or 100 miles with Lithium Ion. Q: Why are your kits AC and not DC? A: Good Question. The DC kits that are available started their life in a folklift or golf cart. The AC motors we use were made to replace the gas engine in a car or truck.They are 5% more efficient then DC. If the SUV you are using for conversion has a good body there is no reason you can't get 20 years out of it.This AC electric motor drive system is the same type as the Toyota Prius and the Chevy Volt. As new batteries are developed all you will need to do is change the batteries to the new type. Q: Why use the Ford Explorer. A: People have come to love their SUV's and we do too. We looked at the donor cars and trucks available for conversions and the most common are Honda civics,chevy S10 or toyotas.The reason is they are a standard shift vehicle. 99 per cent of the vehicles made today have automatic transmissions and the computer tells the transmission when to shift. No one has been able to overcome this problem till now. It has taken us a long time but we finally developed the mechanism that allows the automatic transmission to work with the electric drive system. Q: With your converson kit will I have Air Conditioning and Power Steering. 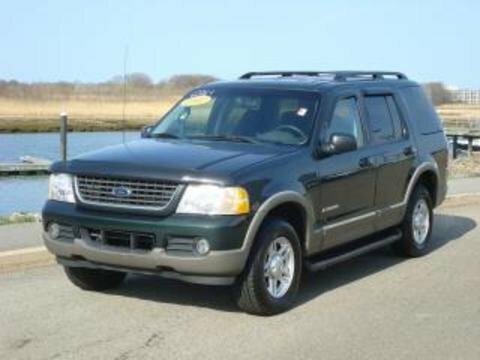 A: Yes,This is the reason we choose the Ford Explorer, you do not have to give up your comfort to go electric. Q: How much does it cost to fully charge a car. A: A 6 hour charge at todays price is about 90 cents. Note: 6 hours is at 110 volt and batteries fully draned at 220 volts it takes 3 hours. Q: If we all drive electric cars what will be the drain on the power grid! A: This is a good question the answer is very little. Unfortunately this is one of the draw backs of batteries you can NOT fast charge them. Electrons must go in slowly about 6 hours, but the good new's is at todays prices that is about .90 cents per charge. Q: What's the power difference between gas and electric! A:Horse power on a electric engine is not figured the same as a gas engine so torque is what to look for. On a Ford Explorer with a V6 gas engine with 210 HP produces 254 foot pounds of torque. An electric motor with 80 HP produces 280 foot pounds of torque Note:as you can see the electric wins hands down. Q: What does the electric vehicle have over the hydrogen vehicle! A: It takes 3 gallons of gas to make one gallon of hydrogen so don't look for it any time soon. Nuclear power is the only way it will come to be. But if it happens all you would have to do is take out the batteries and put in the hydrogen fuel cell.The cell will produce the electricity to run the electric motor. Q: Can I get an Electric shock from the batteries! A: Yes you can. As you add batteries to the system the voltage increases and if you are touching the positive wire and the negative post you will get a shock. This will not hurt you. With the batteries hocked up you can touch them and not get a shock. If you do, then you have a battery cable to close to another battery cable somewhere in your wiring. This is a non grounding system your positive & negative wires go into the inverter and are not grounded. The normal 12 volt car battery is grounded to the chassis but not in the High voltage DC to AC drive system. Q: What type batteries do I use!